just write: seven letter lie. | The girl who loved to write about life. 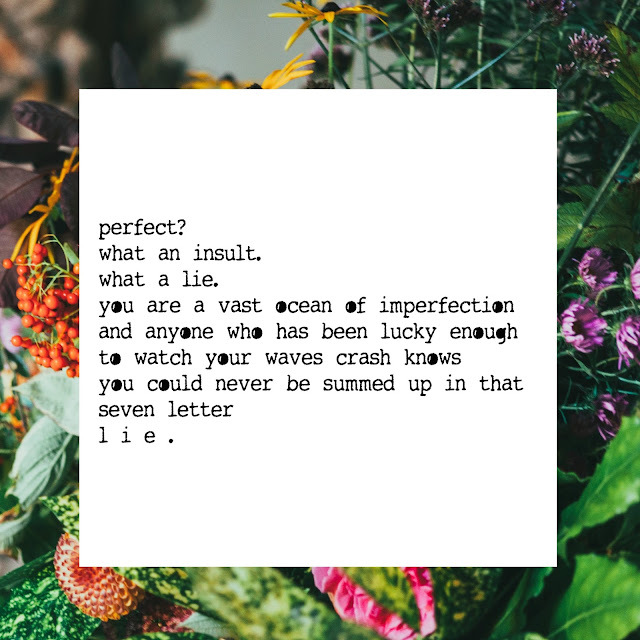 you are not perfect; anyone who has told you so was a liar. but they were also blind, and did not look closely enough. if they had, they would have seen you and seen that your so-called-imperfections are what make you incredible. the crinkles around your eyes from years of laughing and the chip in your tooth from that one time that one summer and your stretch marks from when you grew into yourself and your anxiously-bitten nails because you care so much and your laugh that is so loud, so different that strangers must turn around to look at your joy and your splotchy birthmarks and your frizzy hair and your sometimes-stutter and how tears spring to your eyes over any emotion. perfect? what an insult. what a lie. you are a vast ocean of imperfection and anyone who has been lucky enough to watch your waves crash knows you could never be summed up in that seven letter l i e .